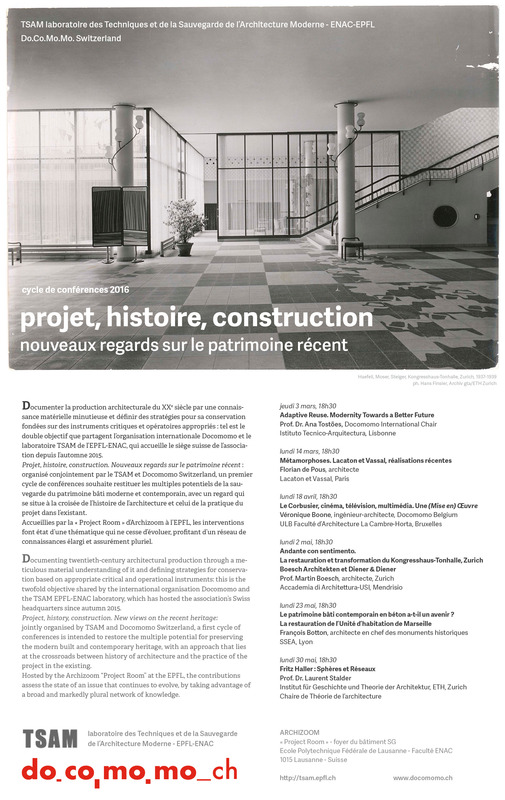 docomomoÃ‚Â Switzerland and TSAM Laboratoire des Techniques et de la Sauvegarde de lÂ´Architecture Moderne - ENAC/EPFL are organizing the series of conferences "Project, History, Construction", to be taking place between 3rd March and 30th May 2016, at Ecole Polytechnique Federale de Lausanne, in Switzerland. Project, history, construction. New views on the recent heritage: jointly organised by TSAM and Docomomo Switzerland, a first cycle of conferences is intended to restore the multiple potential for preserving the modern built and contemporary heritage, with an approach that lies at the crossroads between history of architecture and the practice of the project in the existing. Hosted by the Archizoom "Project Room" at the EPFL, the contributions assess the state of an issue that continues to evolve, by taking advantage of a broad and markedly plural network of knowledge."